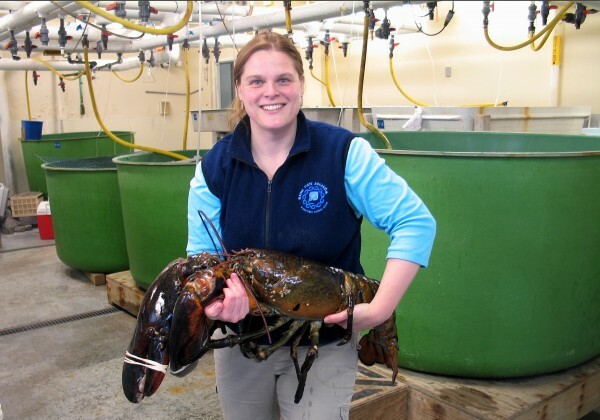 Maine State Aquarium Director Aimee Hayden-Rodriques holds a 27-pound, nearly 40-inch long, lobster caught by Robert Malone off the coast of Maine near Rockland on Feb. 17, 2012. The aquarium named the crustacean Rocky. BOOTHBAY HARBOR, Maine — A giant 27-pound lobster has been caught off the Maine coast, but it won’t be going into a pot of boiling water. Cushing shrimp fisherman Robert Malone caught the monster crustacean in his nets Friday, said Maine State Aquarium Director Aimee Hayden-Rodriques. Malone gave it to the Department of Marine Resources for its aquarium in Boothbay Harbor. The beast weighed in at 27 pounds and measured nearly 40 inches long. It was dubbed Rocky because it was caught in the Rockland area, but Hayden-Rodriquez said it could have been named for Rocky the boxer because its claws are big enough to pack quite a punch. The lobster is the biggest ever brought to the aquarium, surpassing the previous biggest one by 4 pounds. It’s downright huge compared to lobsters people eat, which typically weigh between 1 and 2 pounds. The biggest lobster on record was caught off Nova Scotia and weighed more than 40 pounds. Hayden-Rodriquez says Rocky will soon be released into the ocean because he will fare better in the wild.